Yesterday was a good day for sampler technology! First: the serial link between the MCUs is now totally robust and fast. As I suspected the real problem with the serial before was the internal RC oscillator on the helper MCU. For now it’s been replaced with a 7.3728MHz crystal, but Digikey just rolled up with some 18.432MHz crystals this morning which I’ll be using instead, I think (these particular and seemingly-weird frequencies are exact integer multiples of common UART frequencies, and allow 0 baud rate error). Second: It makes audio! Since I already put a picture of a noble sawtooth wave up a million years ago and since the old sampler definitely did this just fine, this is less exciting. BUT it does mean a couple things. The new DAC works, and the analog sections (mostly) work and all the volume pots are the right way around. 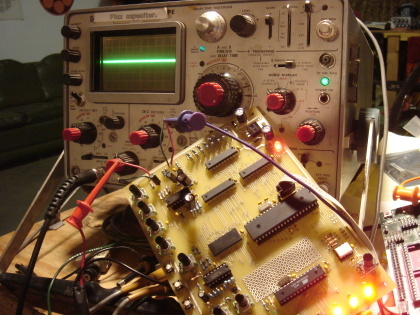 The VCO works, and the jitter generator — Oh boy does it work! All these need tweaking but they’re all rocking solid. Third: I spent a long long time fiddling with the PCB and tracking down noise demons. This, I am happy to say, was a big success and a _huge_ improvement on the old sampler! 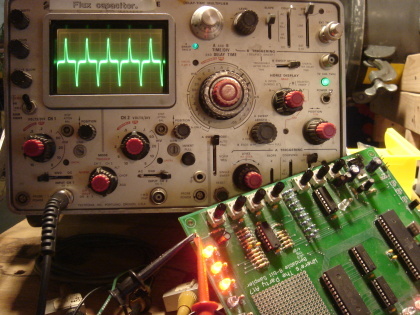 Pictured above are some example waveforms. On the left is a picture of the output of the old sampler with the preamp gain, through level, DAC level, and master volume all the way up. You probably can’t read the V/div knob on the scope, but this waveform is unmistakably clock noise which has capacitively coupled into the audio path and has been amplified such that it is ~220mV at the output. Yikes! This is really bad. Those of you who’ve heard the original WTPA know that this whine is one of its not-so-good-akshully characteristics. The photo on the right is a noise picture of the new sampler after a little screwing around by me. Under full-gain, worst-case noise conditions, the new sampler has approximately 4mV of clock feedthrough. This is 34.8dB of improvement! There are a couple noise sources in the WTPA family. One source of LF noise is the LEDs pulling current spikes from the supply when they turn on. This is at its worst when running from a not-so-low impedance supply (like a 9v battery or worse an STK500 through the ISP header) and did manage to find its way into the audio but it wasn’t terrible. The best fix for it was to improve filtering at the op-amp reference terminals (the VDD/2 level at the non-inverting terminal of a summing amp, say) since the noise that got there got amplified by the circuit’s gain. This helped for sure. By far the worst noise source is clock bleedthrough, although the new design also shows bleedthrough from the white-noise generator. Improving this was a little trickier. A couple things made a big difference. Varying the gain on the preamp as opposed to keeping the gain fixed (and high) and attenuating its input level was one. Re-doing the design with better ground and signal routing mattered A LOT, although I still had to rip up a trace with an exacto — one poorly-thought out connection added nearly 100mV to the output noise here. Filtering the analog references better helped deal with this noise a little, too. Finally, I think a ground plane (or two) are in order for the final hardware revision. I also think associating the VCO and Jitter Generator with the digital supply lines (or at least isolating them from the quiet amplifier analog supply) would be a really good idea. I might even use a choke input to the quiet analog supply. We’ll see. Either way, this statistic is already A LOT better than it was, and I’m excited. Next: Sampling / RAM / throughput rate test, and more fun analog tweaking. This entry was posted on Wednesday, December 10th, 2008 at 11:25 am	and is filed under Uncategorized. You can follow any responses to this entry through the RSS 2.0 feed. You can leave a response, or trackback from your own site.